The Apollo 14 mission landed on the moon and lasted from 31 Jan to 9 Feb 1971. Photo courtesy of the USS Hornet Museum. 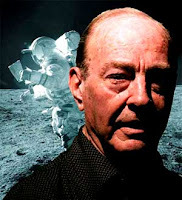 WASHINGTON, DC - April 19, 2009 - Retired navy captain and Apollo XIV astronaut Edgar Mitchell today called for the U.S. government to disclose to its citizens and other Earthlings what he asserts are the realities of long-standing extraterrestrial visitations and interactions with our planet. Speaking this morning at "X-Conference 2009" in Gaithersburg, MD, a suburb of the nation's capital, Mitchell (left) told several hundred attendees and a phalanx of video cameras that, with our planet confronting population pressures and critical questions of environmental and energy sustainability, the need for disclosure about ET involvement with Earth is critical. Mitchell contends that the dispersal of knowledge about what he believes to be the end of Earth's apparent quarantine from other civilizations, and advancement of planetary culture beyond its present fragmentation and incoherence, are desirable results of the widest public release of information about the extraterrestrial presence he believes is real. The conference, organized by long-time "UFO Disclosure" activist and one-time Maryland congressional candidate Stephen Bassett (right), centers on an emergent field of cultural reconsideration its advocates term "Exopolitics." Bassett's nonprofit Paradigm Research Group has mounted a decade-long broad spectrum campaign advocating disclosure of what he says are unwarranted secrets about "UFOs" and "ETs" held over as unnecessary "Cold War paranoia." Questions of "What do we do and say after we say 'Hello!' to ET?" remain distant from wider public consideration, let alone consensus about their implications for national sovereignty, religious traditions and global policy formulation, discussions about which conference organizers and presenters are intent on provoking. Mitchell, Bassett and other "ET disclosure" activists are banking on President Barack Obama's repeated assurances that government agencies withholding information from US citizens are "on notice," in the President's words, that an era of unnecessary secrecy is over. Obama has said his administration's tendency will be to unlock what he and senior officials consider information rightfully belonging to the public, while recognizing constraints required for national security, a presidential promise replayed on video at the conference to sustained applause by hopeful disclosure advocates. "We live in challenging, magnificent times," Mitchell said, emphasizing that, in his opinion, information that we are not alone in the universe - and indeed, he said, that we here on Earth are having ongoing interactions with nonterrestrial beings - may provide a key to consciousness changes he and his colleagues believe are necessary. Mitchell said he believes such changes are essential for Earth to make progress through problems confronting humanity's competing needs, religious imperatives and cultural fragmentation. His efforts since leaving NASA and the space program have been focused on exploring frontiers "of the mind, body and spirit," he said. Mitchell acknowledged that, before humanity can travel with practicality much beyond our own solar system, solutions to Einsteinian limitations to faster-than-light propulsion of our spacecraft must still be solved, a frontier the aging astronaut said he believes science eventually will do. 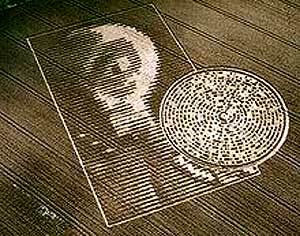 But he stressed that our own limitations have not limited the extraterrestials he asserts are present on Earth. "The aliens have done it!" Mitchell said of an apparent ability to traverse what to us are insurmountable distances. He contends that as a result of wider public awareness of the ET presence, revisitation of much phenomenology catalogued in human history should precipitate revision of how we understand planetary history in light of what he believes are long-standing extraterrestrial interactions on Earth. The astronaut, who told Cape Cod Today he was raised in a strict Baptist household, said reevaluations of source phenomena that led to Earth's major faiths, and which he said foster divisions among humans, might be another of the beneficial results of wider awareness of what Mitchell believes is the historical and ongoing "ET" presence and their asserted involvements in human development. Mitchell and his fellow explorers of what he has called the "Frontiers of Consciousness" have long contended that broader public awareness of the extraterrestrial presence and interactions the astronaut-scientist believes are reality could help promote a "global mind change." 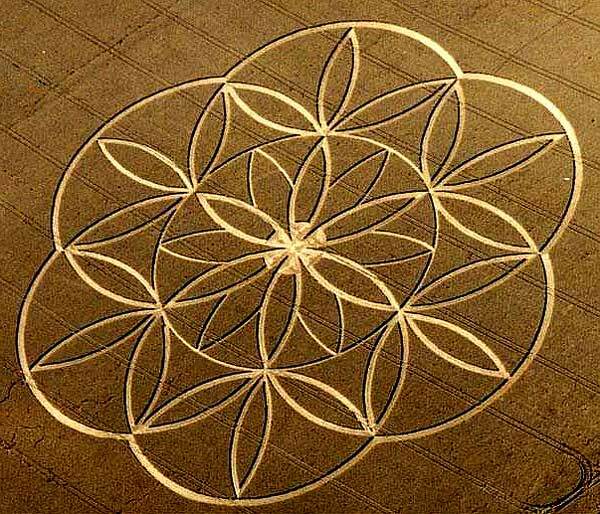 Mitchell and colleagues assert this could point us toward "planetary transformation," helping Earth's culture to mature sufficiently to gain entry into a wider community of civilizations for which they believe abundant evidence exists, now and throughout history, when viewed through a filter in which the claimed extraterrestrial presence is considered. Taking questions following his presentation, Mitchell told Cape Cod Today that his beliefs as expressed this morning about extraterrestrial involvements with humanity on Earth are drawn from information generally available to those who study the field of alleged "ET-UFO" events and experiences, citing no "secret information" to which he has been privy. 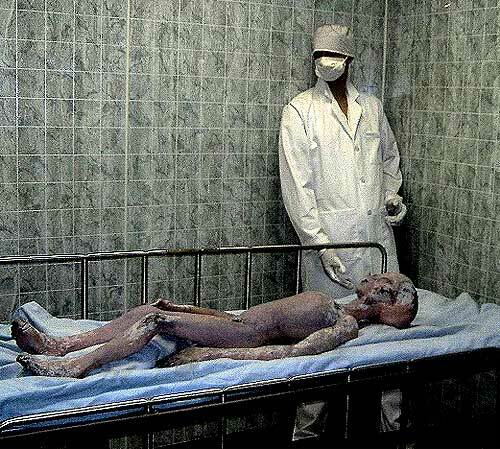 He also contradicted some other presenters at X-Conference 2009, who claimed that Mitchell and the other NASA astronauts were briefed before their space flights about potential encounters with UFOs of an extraterrestrial nature and how to handle or disguise them from the public. He said unequivocally that this did not occur. 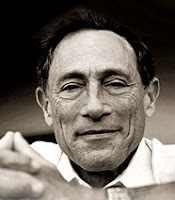 In a previous private interview with Cape Cod Today, Mitchell also expressed skepticism about some of the more popular "UFO conspiracy lore," i.e., stories that NASA astronauts did not really visit the moon or that the space agency has been covering up satellite photographs of Mars purportedly showing evidence of past civilizations. "We had no briefings on UFOs during our astronaut training," Mitchell told the conference, suggesting that "human nature" tends to embellish and distort things about which there is insufficient information or which embody concepts disruptive of our respective world views. 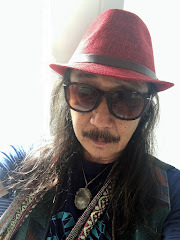 He also acknowledged that the UFO field has often been the target of disinformation and intentional misinformation seedings throughout the years, some perhaps for legitimate national security reasons having to do with terrestrial aerospace research and development. But Mitchell's stance on NASA-centered conspiracy theories about "ET UFO" remained firm in the face of questions. "It was not mentioned during my career," he said, adding that he and his fellow spacefarers saw no evidence of space visitors on the back side of the Moon, another long-standing tale among the more cult-like cohorts of UFO faithful. 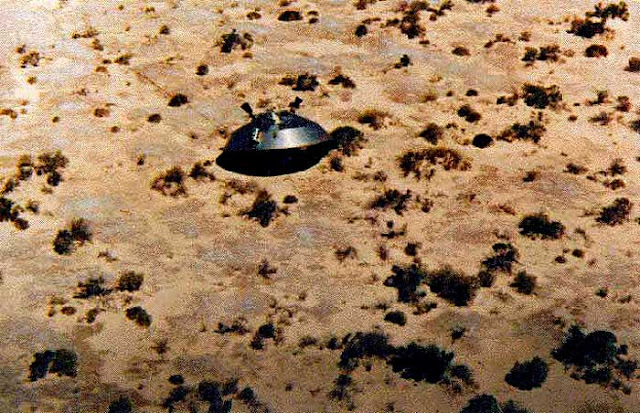 Mitchell said decades of "UFO disclosure" revelations, drawn principally from elderly military and nonmilitary folks claiming bits and pieces of the larger puzzle about what they believe really happened at Roswell, NM in 1947, helped shape his belief that the event actually took place and was not, as the US Air Force claimed, a crash-test balloon. 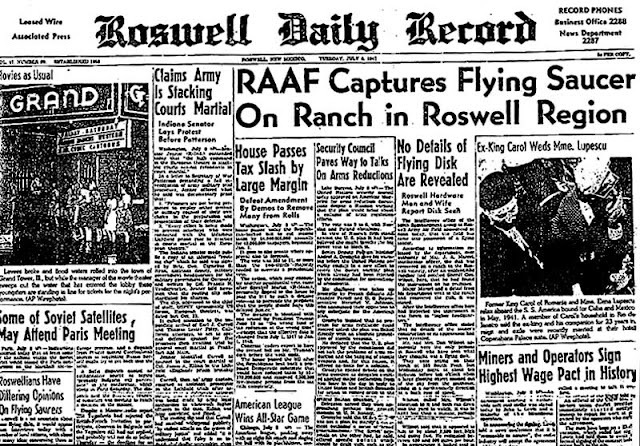 He cited what he described as the credibility of the witnesses and the coherence of their stories as influencing his belief in the reality of the ET scenario attendant to the Roswell event, which stems from a 1947 cover-story released in July of that year after a crash of some unspecified aircraft not far from Roswell Army Airfield (RAAF). 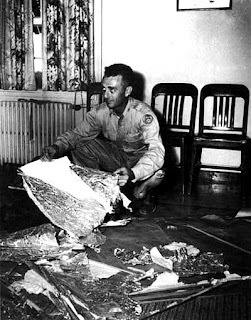 The next day the initial "recovered flying saucer" cover story issued by Roswell AAF public affairs staffers was countermanded by a senior Army Air Force commander, who said a "weather balloon" was what had crashed, pieces of which had been recovered. 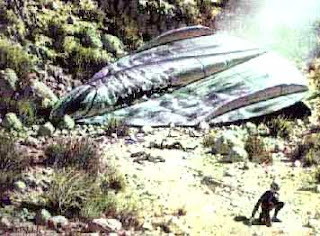 The story died for three decades until being resurrected in the early 1980s, eventually prompting a 1994 U.S. Air Force revision of their "official story," contending that the Roswell crash was of a "Mogul" project balloon of the type used for atmospheric monitoring to detect possible Soviet nuclear weapons tests. 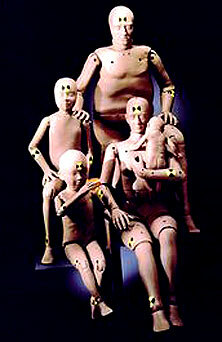 A subsequent version of the Air Force story was that the alleged "recovered alien bodies" endemic to some Roswell crashed saucer tales were, in reality, "crash test dummies" used for testing experimental high-altitude equipment for the U.S.'s growing strategic bomber forces. 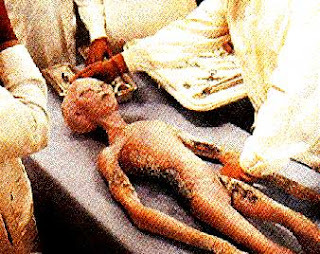 As is well known to worldwide "UFO" enthusiasts, the Air Force's efforts to defuse the Roswell story were in vain, and a host of alternative scenarios have persisted. 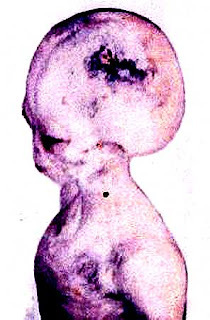 These range from "ET crashed saucer recovery" to speculations that the event being camouflaged was human experimentation on unwitting subjects, in contravention of the then-recently adopted Nuremberg Protocols governing medical experimentation on humans following disclosure of Nazi concentration camp Holocaust horrors. 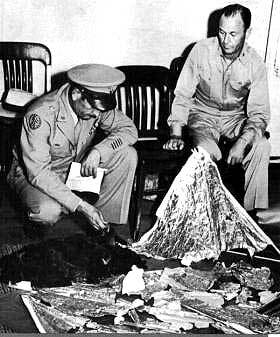 Mitchell is among many former military officials and large numbers of US and world citizens who scoff at the Air Force "clarifications," citing what he says are the credibility of the witnesses and the coherence and consistency of their recollections, in his opinion, that an extraterrestrial craft indeed crashed and the event covered up for six decades. "What more do you need?" Mitchell declared, asserting that the Air Force's balloon stories are transparently false. 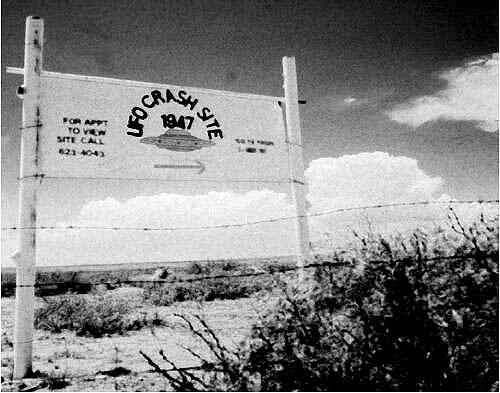 Ironically, the future astronaut grew up in Roswell, NM, where his family had a ranch not far from the alleged crashed saucer site, although Mitchell said that at the time it happened, he had no firsthand experience or knowledge about it. But other space related research was going on at Roswell during Mitchell's youth, as rocket pioneer Robert Goddard had moved his research and testing program to Roswell in the 1930s and launched numerous experimental rockets. The youthful future astronaut was captivated by Goddard's efforts, which captured his imagination about possible travel away from Earth and to the stars. 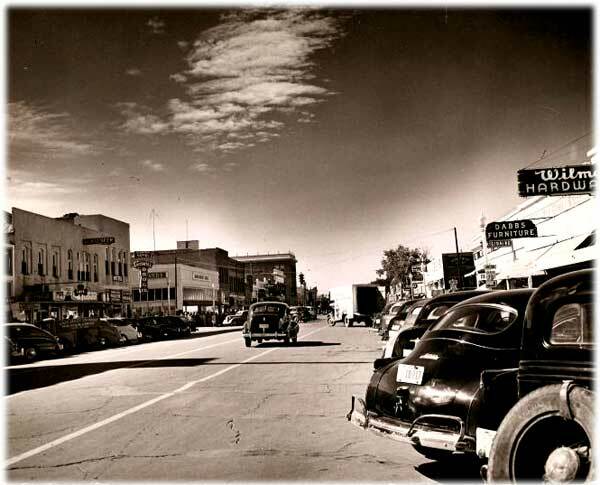 Mitchell also related that in 1945 he and his family's neighbors witnessed the bright, white flash over the horizon which signaled the advent of the atomic age with testing of the first nuclear weapon at the Trinity site. Mitchell said the bomb influenced him significantly when he later learned what it was and, much later, better understood its implications. Mitchell said he believes the nuclear explosion also may have attracted the extraterrestrial presence he believes resulted in the alleged ET aircraft collision which UFO researchers have claimed for three decades happened near Roswell, which is situated not far from where the nation's first nuclear weapon was detonated. 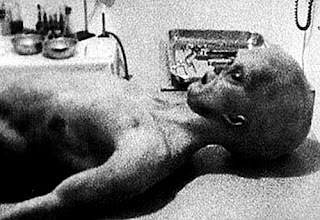 "I have a sneaking suspicion that the reason for Roswell (as the alleged ET aircraft crash is euphemistically termed) was that the UFO phenomenon was drawn to our nuclear sites," Mitchell told the gathering. He said he is concerned about the tendencies of terrestrial governments and their militaries to stake claims and perhaps fly weapons in space, a concern Mitchell believes may be shared by the intervening extraterrestrials. 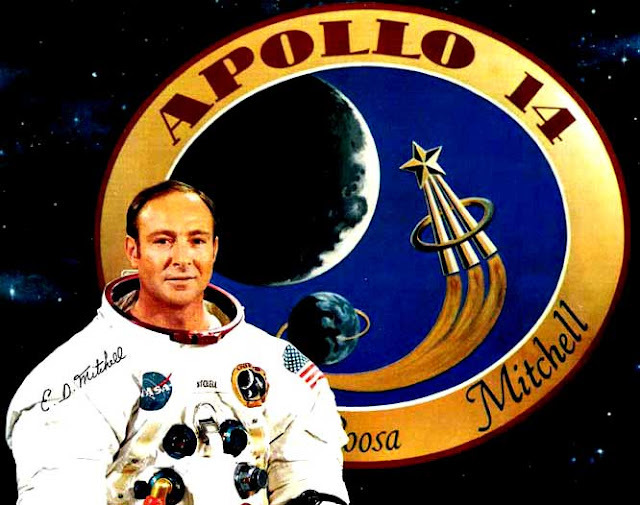 Mitchell said that many years ago, after leaving NASA, he authored a manuscript advocating against militarization of space attendant to nationalistic colonization of the high frontier for military advantage or benefits other than for all of humankind. 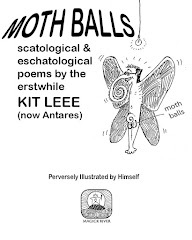 "I submitted it to thirty-four publishers, and all refused to publish it," Mitchell said. He told the X-Conference that his coming forward so unequivocally at this time reflects his concerns about the direction our planet is heading and his belief that wider public awareness that "we are not alone" will precipitate a healthier consideration of Earth's future. Mitchell is slated to appear at the National Press Club tomorrow morning (Monday, April 20, 10 a.m.) to amplify his encouragement of the Obama administration to compel disclosure of what the U.S. government may know about the extraterrestrial interactions with humanity the astronaut said he believes have been happening and remain ongoing. And as for the Cape Cod connection? The late Harvard psychiatrist Dr. John E. Mack (left) , a former summer Cape dweller who studied and wrote about purported "ET alien abductions" in the early 1990s, and long-standing "ET abduction" researcher (and Provincetown resident) Budd Hopkins, a New York modern artist who has studied the phenomenon since his own "UFO" sighting in 1964, met each other at the Cape. They were introduced by a mutual friend, Dr. Robert Jay Lifton, the acclaimed psychiatrist and author, also at Harvard, who lives on the Cape. welcome to earth. 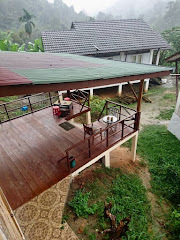 we wud like to recommend najis ton rosak to be our representative (or earth specimen as u may want to call it. sori, him) for the foreign exchange prog to your galaxy. it will be an awesome experience that your comrades will never want to miss. 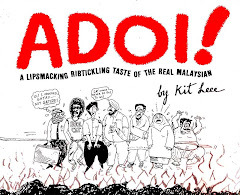 BEAUTY & THE BEAST ~ Malaysian style?